Being able to backup a legally owned DVD for personal purposes is an inalienable right of the consumer. According to the Italian copyright law (law n. 633, 22 April 1941, and further modifications) the copyright holders must allow one private copy to be made (art. 71-sexies) but they can implement cryptation to defend their rights (art. 102-quater). Auto DVD Backup is a GUI (Graphical User Interface). It uses a number of different tools to convert an unencrypted IFO/VOB set of a DVD into a two-pass XviD AVI which is coupled "on the fly" with multiple WAV/AC3/MP3/OGG audio tracks and multiple RAR-compressed subtitles. 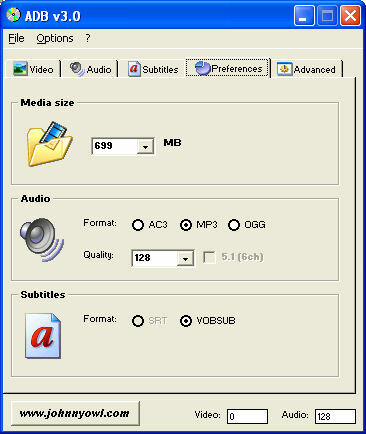 The result (ready to be burned on CD-R or DVD-R) can be played back with any Windows PC equipped with the XviD codec (for video playback), the Ogg Vorbis DirectShow filters (for OGG audio playback - optional) and VobSub for DirectShow (for subtitles playback - optional). This method has distinct advantages over traditional "muxed" AVIs: there is no audio "overhead", so that more space (meaning more quality) is reserved for the video, and one retains the freedom to interleave the video with one (or two) of the multiple audio tracks at a later stage (through VirtualDub or AVI-Mux GUI) to use, for example, in a Stand-Alone hardware-based media player. Auto DVD Backup is also designed to be very easy to use, but extensive customization is possible: it produces a Windows batch file (BAT) and other human-readable (well... geek-readable) files which can be edited at will. Altogether, it is a very open and very light solution.